The author, a professional conservationist, tells his own stories of truly exhilarating encounters with British wildlife, especially birds, while working as a nature warden. These lively and vivid memoirs take the reader on an eye-opening journey through some of the most interesting and diverse habitats of Britain, recounting many thrilling and intimate experiences with its special birds and wildlife. Sixteen colour paintings and drawings illustrate some of the anecdotes in the book. Illustrators are Barry Robson and Ian Ryding. It feels like I’m teetering on the very brim of the World. I’m struggling to keep my balance as I walk precariously along the two parallel railway sleepers that serve as a path beside the seawall. The mild, misty November day has now cleared to a crisp evening. For as long as I can recall I have felt the lure of this stretch of the north Norfolk coast. My mother grew up here, in Brancaster Staithe, following generations of sailors and fisherfolk (and almost certainly some part-time smugglers and wreckers). Today, a few distant relatives still eke out some kind of living in this liminal land, between the creek-riddled salt marsh and the sandbar-shifting sea. It happened during my time as a trainee Warden on the north Norfolk coast. It was the end of January, and Titchwell Marsh RSPB nature reserve was in the grip of a freeze. From mid-morning thick flurries of snow had been falling, and it now lay some 10 centimeters (4 inches) deep on the ground. Adam, the Site Manager, took a call from a member of the public who had spotted a distant large, dark mass on the beach just west of the reserve. She thought it could be a whale. ‘Twenty minutes,’ declared the woman as she overtook us on her heavy old pushbike. It was a cranky looking machine, with a wicker basket on the handlebars containing a bottle of milk and a loaf of bread and with a black umbrella strapped to the frame. We were walking along the drove way that follows the bank of the South Drain. This is an artificial waterway linking the Rivers Brue and Cripps to the canalised Huntspill River, which together decant into the Bristol Channel. Shapwick Heath was ahead of us to the west and Ham Wall behind us to the east. 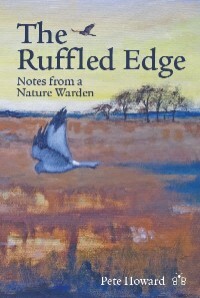 Pete Howard's book 'The Ruffled Edge' is featured in the 'Birdwatchers Yearbook', published by David Cromack under the heading 'Best Bird books of 2012'.